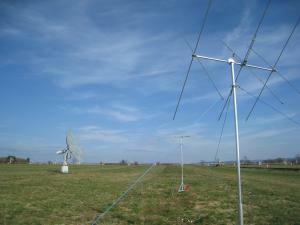 BRAMS (Belgian RAdio Meteor Stations) is a network of radio receiving stations using forward scattering techniques to study the meteoroid population. The project is coordinated by the Belgian Institute for Space Aeronomy (BISA), in the frame of the Solar-terrestrial Centre of Excellence (STCE). It is also a very fruitful collaboration between professionals and amateurs since most stations are hosted either by Belgian radioamateurs, groups of amateur astronomers or astronomical public observatories. 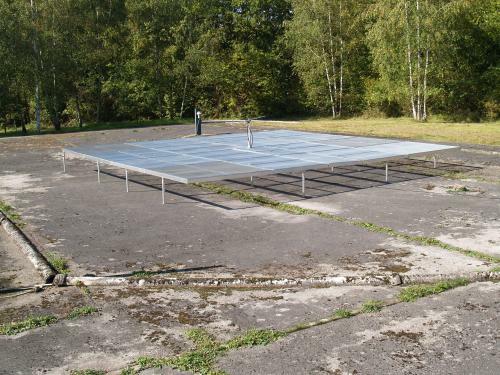 A dedicated beacon was installed in September 2010 in Dourbes (South of Belgium) at the Centre de Géophysique du Globe (which belongs to the Royal Meteorological Institute of Belgium (RMI) and acts as the transmitter. It emits a cw circularly polarized signal at a frequency of 49.97 MHz with a constant power of 150W. Around 30 receiving stations are spread on the Belgian territory and have been equipped with hardware material procured by BISA to listen to the beacon. See map of the existing stations. The material is identical for each station, allowing an easier comparison of the data. Each station is using a three-element Yagi antenna, a commercial ICOM-R75 receiver, an external sound card (as analog/digital converter), a GPS clock (to synchronize the stations) and an amplitude calibrator designed at BISA (to calibrate power profiles). Only PCs are not provided by BISA but are used only to store locally the data. 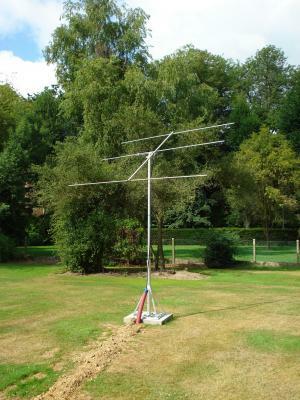 The picture below is the receiving antenna used at the station in Uccle. If you are interested in joining our effort, you can host a station and present radio-observations of meteors to your visitors. If you have any question, please contact us. One of our receiving stations is located in the radioastronomical site of Humain which belongs to the Royal Observatory of Belgium (ROB). This station has interferometric capabilities using the 5-antenna design described in Jones & Jones, Radio Science, 33, 55-65, 1998. With this interferometric system we will be able to measure the directions of the radio meteor echoes with an accuracy of about 1°. This will help us to retrieve individual meteoroid trajectories in the frame of the METRO project. To collect and standarise the meteor observations of all the stations. To write codes for automatic detection of underdense/overdense meteor echoes. To compute meteoroid flux densities for meteor showers and mass indexes for meteor showers and sporadic meteors. To promote radio-observation of meteors. BRAMS was initiated by Hervé Lamy from the Belgian Institute for Space Aeronomy (BISA) and is supported by the Solar-terrestrial Centre of Excellence (STCE). If you have any questions about this project, please contact Hervé Lamy.